Nowadays, Amazon is one of the most convenient places to do your online shopping in Italy. Except that I always had difficulties with the Italian language itself. But then I found out that in 2019 you can use Amazon.it nearly entirely in English. And thanks to the “Sell on Amazon” program where anyone can put up shop, you can find some interesting products that cannot be found anywhere else. With affordable international shipping, I just sometimes cannot resist the temptation! Just that like anywhere in Italy.. English is not their strong point. I was surprised to find out, that it’s possible as well as reasonably easy to, let’s say convert the registration page to an English version. So that pretty much every page of the online store is in English for the most part. How I did it, was a simple question of setting up my browser to translate the website from Italian to English automatically as I open each new page. Which was not too difficult, after finding the right browser extension that enables this kind of a feature. I noticed that most translation add-ons were no good, so after doing a lot of research I have compiled a small list of web browsers and the best way to accomplish this for each browser. Just select yours from the list (which will hopefully grow in the future). Those already browsing with Chrome have it easy. If your browser language is set to anything other than Italian, it will ask you to translate pages that are in a foreign language. Works for other languages too, like Spanish & French. Firefox has a very useful extension that automates the job completely. Just download ‘S3.Google Translator‘ and it will install itself with a click of a button. After a browser restart you will see a new icon on the top right corner. You have different settings, but just enabling the “automatically translate www.amazon.it” option will do! 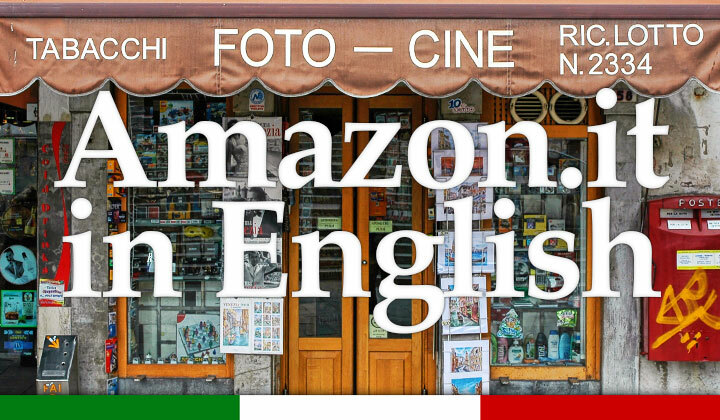 I hope this has been a helpful guide, and that you know now how to register and buy from the Amazon Italy store, in English! Experiences, comments are most welcome below! I’ve noticed Chrome can sometimes do this. Hopefully this is a temporary error, as there seems to not be any definite solution. You can try things like closing and opening up the browser again, updating Chrome, trying to translate other website first, restarting. And grazie mille David — this is working out very well for me. I have purchased thousands of dollars from the Amazon italy site….